The most recent review comments are still valid. It has nicely prepared RV spots. Only downsides are, as it was raining & snowing, the gravel covered dirt at the hookups became squishy and muddy, and, there won't be not much shade for the summer months as the trees are still young. After a snowfall the RV park roads were cleared with an onsite plow so getting out to the main roads and interstate was easy. I would stay here again. We stayed 1 night while passing through the area. The park is a short drive from I-80 (Exit 180) along paved rural & city street. The interior roads are paved. The interior roads and turns are sufficient to maneuver larger RV’s. The sites are a mixture of back-ins and pull thrus. Although the park was built on a slope, the park seems to understand the simple concept of the importance of a flat, level site as the sites were slightly tiered so they were generally level and flat. The parking pads are pavement. The P/T sites were long enough to say connected to a toad. Sites had sufficient room for opening slides. They have full hook ups – water, electricity (50/30/20 AMP), & sewer. The sewer connection was slightly above the ground so it could be difficult to establish a downhill flow depending on discharge point. There was an outside table but no fire pits. Distance and gravel areas establish privacy between the sites. Some of the sites appear to be extended stay sites. There were trees scattered throughout the park so satellite reception would be dependent upon your site and dish configuration. Park brochure showed a 68 cable channel lineup. No mention of OTB channels. The park provided WiFi was good. It was password protected. Didn’t try our Verizon WiFi hotspot or NET10 phone so don’t know about reception. There was 1 designated fenced pet area with gravel surface located towards the middle of the park. It had a waste collection station in the fenced pet area. There was sufficient area to walk dogs along the park’s roads. We didn’t use the showers/restrooms or laundry. We would probably stay here again if traveling through the area. TIP: There is only 1 row of pull through sites. They were expanding the park in 2018. Don’t know if they were putting in any more pull through sites. Although the staff was very, very accommodating when we had a flat tire on site and said to not worry about checking out at 11am, I have to say the shower room I used was really in need of renovation. At least change the shower curtains. They looked bad. Otherwise, the park was great. Newer rv park which is set up really well. Large level paved sites. When the trees mature, it will be beautiful. Easy in and out. Would certainly stay here again. We stopped here for an overnight stay on our way to Illinois from California. This place is Wonderful. The bathrooms were so clean and beautiful. They had private showers and it was nice and warm. Considering how cold it was outside. The staff was so friendly when we checked in. And very pet friendly. This will now be our go to stop each time we travel home and back. You can't beat the rate either. Plus cable and WiFi. Thank you for such a wonderful stay. The only reason I am giving this an overall rating of 4 is because they have no grass around the sites. Otherwise, this is a very nice facility. Each site has a picnic table and the sites are LONG which is great! The property is adjacent to a small casino and restaurant and the are very nice there. They have a good size dog park. The park is very large with lots of sites for RVs and trailers and they have LOTS of small cabins for overnight stays. 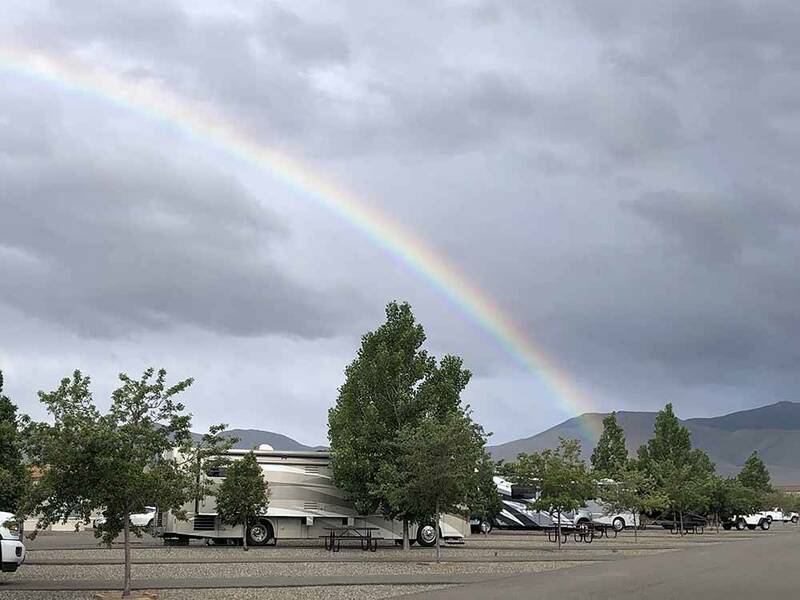 Very clean and new campground that can accommodate any RV. Very nice area of town free of noise and residences. A definite go to place for an overnight stay. Came in for an overnight stay in our fifth wheel. Super nice place - looks brand new! Facility and park are very clean. Laundry room was large, and like everything else, new. Level drive thru was extremely long. I stayed attached to my 30 ft trailer and had loads of room in front and behind my rig. Would recommend this site to anyone coming thru this area. A beautiful, clean, nearly new facility with a helpful staff. Laundry is large and fairly priced. This was our second stay here and we enjoyed it once again! They have paved the Pull thru sites and the trees are getting big enough to provide some shade. I just hope they put in a pool so we could cool off a bit. Very beautiful, clean facility. Plenty of space both for getting around and privacy. Excellent restaurant, cute small casino, clean and new laundry facility. Very friendly staff. We loved the restrooms, and the sites were very level, which meant easy setup. It just didn't have any pizazz to it. All the small cabins surrounding the campground took away the appeal. We found this park by the sign as we were leaving the highway and pulled in to register. The clerk was very helpful and explained everything well. Even though there is no shrubbery to separate the the sites, they are large and have good spacing. The surrounding scenery is also a plus. The rest rooms are spacious and clean. The only downside to the rest rooms is that they are open to people using the Community room. The park is large with over 100 campsites as well as bungalows and larger units which could make the facility quite crowded at times. We would definitely stay there again!